Brand new augmented reality (AR) technologies are coming out each and every day. Today, techies around the world are extremely interested in what one powerful Florida-based company is developing in their AR department. Some people in the tech industry believe this company's latest device could be a game-changer for patients with colour blindness. This company, called Magic Leap , just filed a patent application for an unnamed "colour blindness device." Magic Leap did not show their prototype to any news agencies, but reporters were able to get their hands on Magic Leap's patent application. The patent application described an AR system that could be mounted on the patient's head. This wearable device will have an AR display and be able to sense the differences of light passing through it from world outside. As stated in the patent application, this device would be able to configure and "selectively modify…light from the world based on a colour detection deficiency of the wearer." Unfortunately, when asked for more information on this colour-blindness device, Julia Gaynor, a spokeswoman for Magic Leap, declined to comment. A few people involved on this colour-blindness project include Rony Abovitz, the founder and CEO of Magic Leap; Nicole Elizabeth Samec, a noted biomedical engineer; and Mark Baerenrodt, a leader in the health-care industry. Colour blindness is often inherited and most commonly occurs in men. The most common form of colour blindness is called red-green colour blindness which, as the name suggests, affects a person's ability to tell the difference between shades of green and red. There's currently no cure for colour blindness, but there are numerous glasses and lenses that can help colour blind patients differentiate colours. 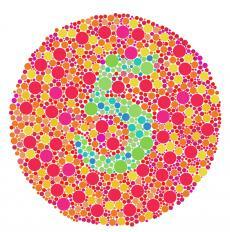 About 8 percent of all men will have colourblindness, whereas only 0.5 percent of women will inherit this disease. Colourblindness genetically travels through the X chromosome, and males only have one X chromosome. Women, on the other hand, have two X chromosomes. The extra chromosome often compensates for any loss a woman might have with her first X chromosome. Magic Leap has a habit of being extremely secretive about their product line. The company's official statement online only says that they are dedicated to develop mixed reality technologies that help people "interact with the world in ways never seen before." Reports show that Magic Leap has been able to raise $1.4 billion in funding from big name investors like Google and Alibaba. The state of Florida has also pledged Magic Leap $8 million in economic incentives. The company will only get this $8 million if it creates over 725 jobs and has a job retention rate of at least 217. Each person working for Magic Leap must earn at least $100,000 each year to be eligible for this $8 million. This isn't the first time Magic Leap has filed a patent in the tech world. In fact, Magic Leap has filed well over 100 patent applications in a wide variety of industries since it was founded in 2011.